I have recently purchased my first smartphone. I must admit I love having a camera with me all the time, though it is huge. I saw this window cling on a car the other day and snapped a picture. I must admit I thought the owner would catch me at it and wonder what in the world I was doing, but it turned out fine. I really like the dots that help to make the wings of this dragonfly. So I started drawing. 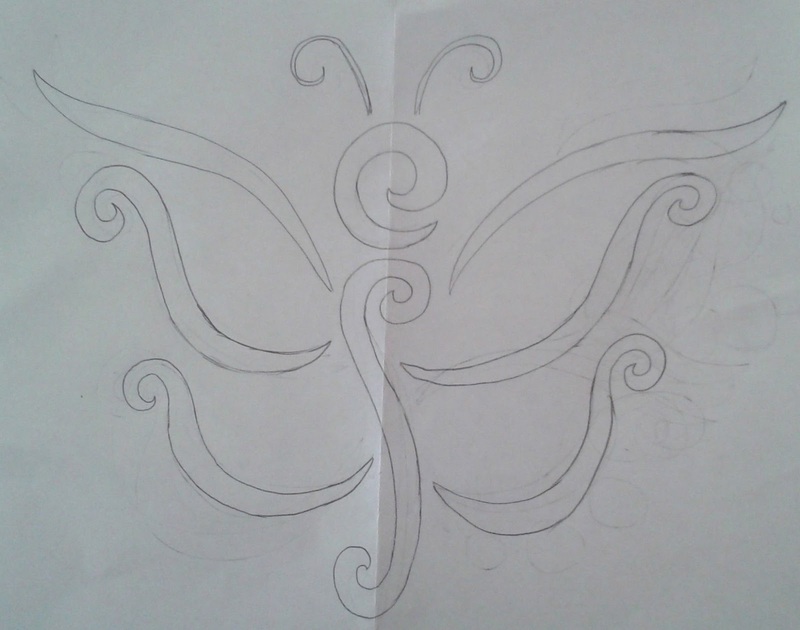 I decided right away to make a butterfly instead of a dragonfly. This is the body that I started with. I decided it was traditional and boring and erased it completely. 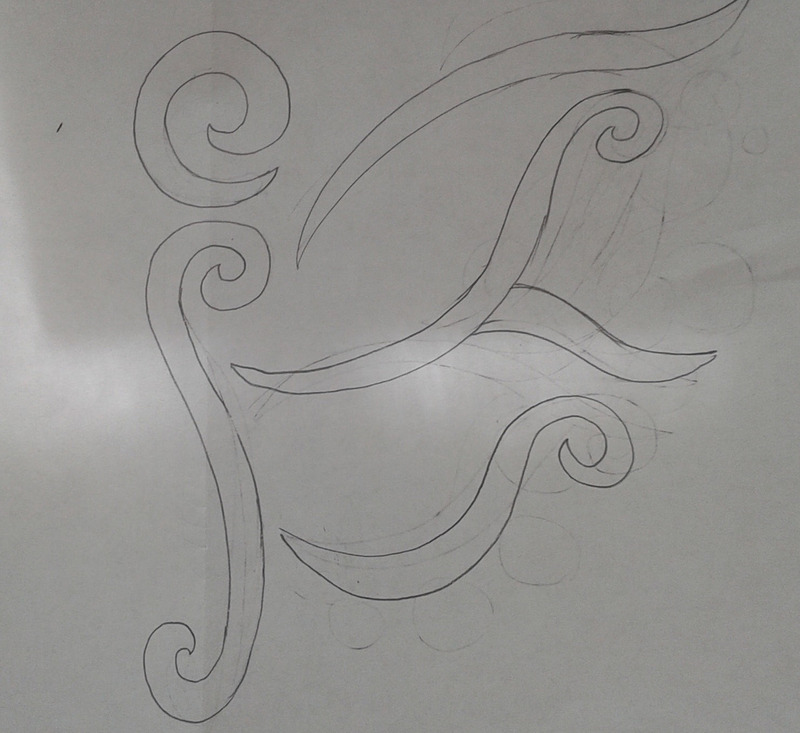 Then I tried drawing one with a curl for a head and a elongated curl for a body. Then I drew in some curls and dots for the winds. It's okay, but I didn't love it. So I erased the wings and tried again. Next I tried long S shapes and curls to make the upper and lower wings. It's okay, but I don't like the lower wing. 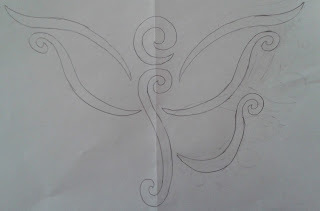 So I erased the lower wing and thought about making it a dragonfly, but in the end I still wanted a butterfly. 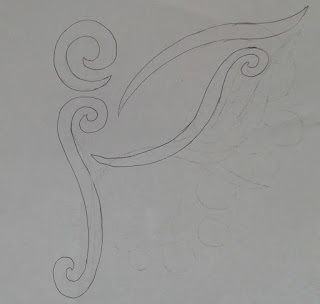 I used the window and traced the left wing so it was exactly the same as the right wing. I decided that the perfect symmetry really didn't suit this more organic butterfly. I think the antennae will have to be either quilted or embroidered. I like that it turned out whimsical and kind of modern. 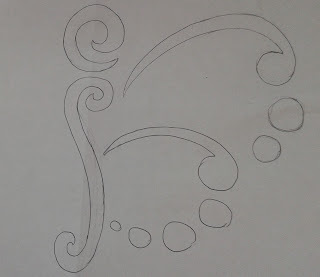 I am thinking I will either quilt the design and then paint it in or applique it. Fun for later! 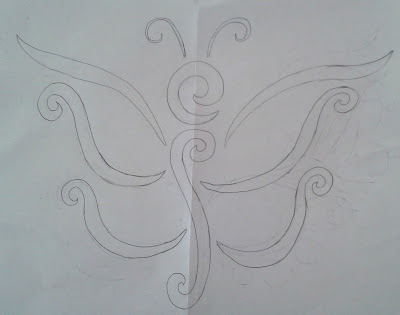 A few weeks ago I designed a butterfly design for this blog as shown below. It was a lot of fun and I was excited to applique it. I started with a gorgeous solid blue background fabric. 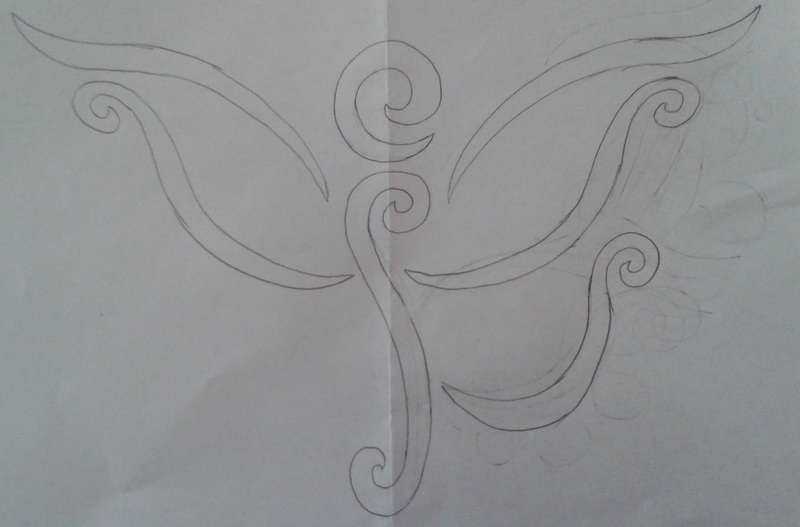 Here's the process I went through in choosing the colors for the butterfly wings. I started by picking out a bunch of fabrics I liked with my blue background fabric. Now that I had a lot to choose from, I laid them underneath the blue fabric with just a 1/2 inch showing because all the pieces for this butterfly are very narrow. I don't like the green with the blue. And come to think of it, I don't want a green butterfly! I like the oranges, but with just a thin strip showing, none of them stick out to me. I really like the stripe on the right side here. It has a lot of pattern for only 1/2 an inch showing! Love the color, but it is a bit pale and I want my butterfly to shine. I like all these crazy prints, but half an inch doesn't really do them justice. The pinks are fun, but I don't like them much at this scale. I really like these two prints. They have a lot of character. Next, I took my favorites and cut a thin piece of each. Looking at these thin strips on the blue helped confirm my choice of the stripe in the center right for my butterfly. My son and I have been reading The BFG by Roald Dahl. It's one of my favorite children's books of all time. In it, the BFG calls butterflies, "butteryflies," and so I think I will call this quilt the Butteryfly Quilt in honor of that memory. I've been working on picking fabric for my butterfly wings and chose an amazing striped batik. 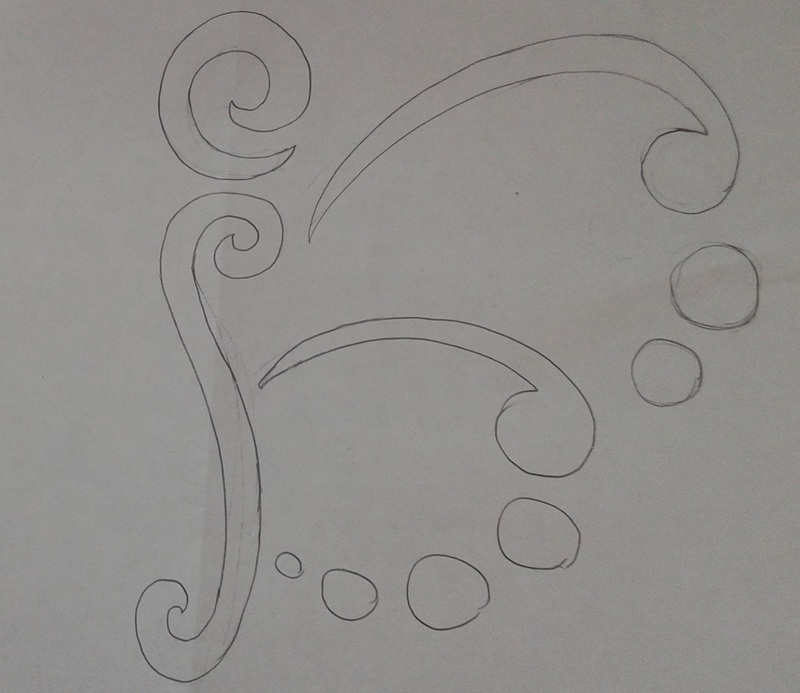 I started by turning the pattern upside down before tracing the shapes on fusible. 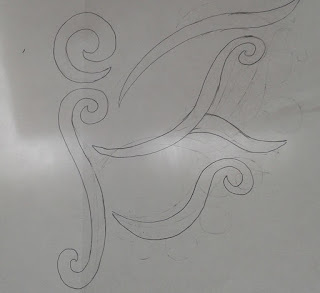 I know fused shapes are reversed, so I had to turn the pattern upside down so that when traced and stuck to fabric they would turn out right side up. Next, I carefully placed my pieces on the striped batik so that I got as many stripes as possible across each piece. I did this on top of a light box so I could see through the fabric to see where the stripes were. 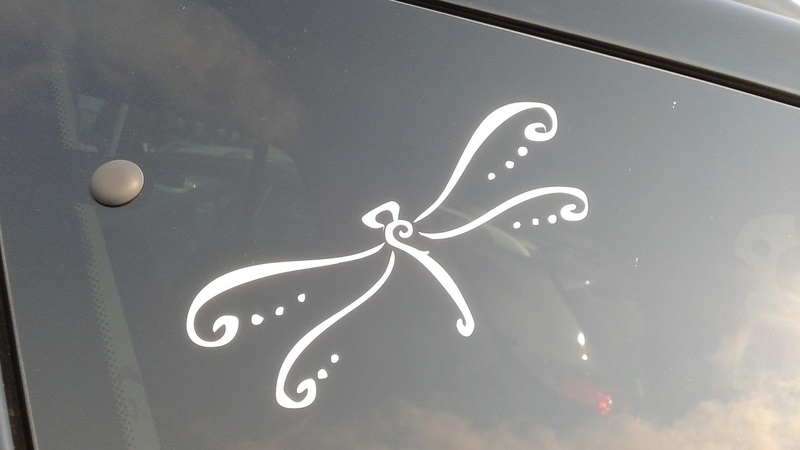 Now I had the butterfly shown below. Now it was time to pick the fabric for the body of the butterfly. I started with the dark purple shown below. It's so dark it's almost black. I was sure it was going to be the perfect choice. However, once I'd cut out the pieces I felt it was too dark. Back to the drawing board and time to test out new ideas. I laid fabrics on top of the butterfly wing pieces to test out which fabric I liked the best. Here are a few of ideas. I ended up choosing the top fabric shown here. I probably tired 10-15 fabrics total before picking the pink. Then I cut out the new shapes and tried it out. I'm very happy with the finished results! The pieces on Butteryfly are very thin. They are about a quarter of an inch at their widest. I knew that I needed to adjust he size of my double blanket-stitch and make it smaller so the stitches didn't go too far into the fabric. I decided to test out stitches at 1.4 millimeters wide and 1.4 millimeters long. I was very happy with the results. The stitches stitched out well (I tested this first! A MUST!) and I was a happy camper. The yellow thread is Polyneon by Madeira threads and the pink is a Sulky Rayon 40 weight thread. I chose these threads because they were the right color. I knew that if I stitched the wing pieces in pink or purple thread it wouldn't work because some pieces were predominantly pink and yellow and others were predominantly purple and yellow. Therefore I picked yellow thread. Of course, I forgot to take a picture of the butterfly before I layered the quilt, so here it is with the pins already in. Oops. 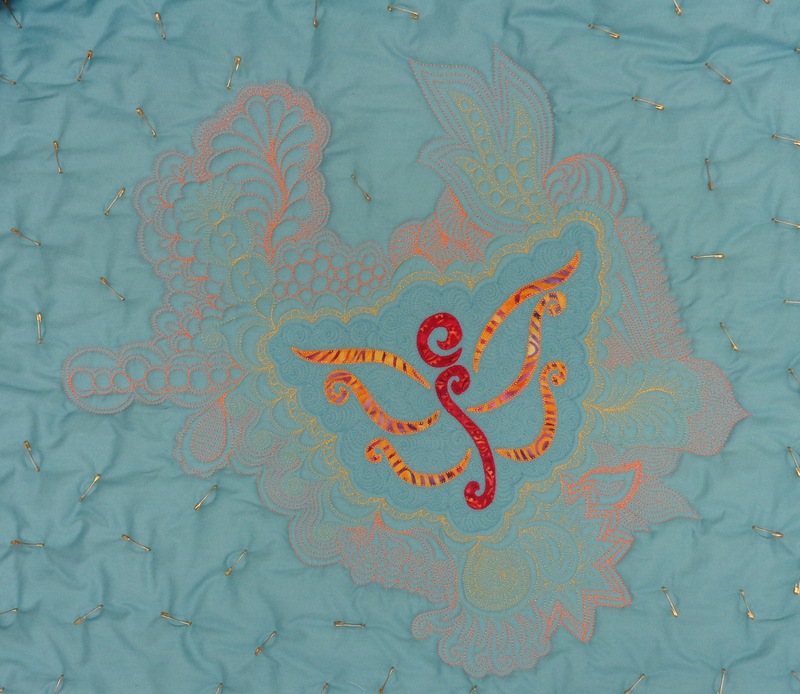 I have decided that I want to try out Karlee Porter's Graffiti Quilting on Butteryfly. I am intrigued by her book after snagging the last copy in Houston last year. The first thing to do seemed to be to try a sample and see what happened. The background is quilted in a slightly darker blue Wonderfil InvisaFil thread. I love the way it looks like clouds. Now that the central background was done, it's was time to have some fun doing Graffiti Quilting! I went down and pulled a bunch of threads that made a gradation of threads from yellow to pink. I wasn't sure how many I'd want so I started out with a lot. I knew this was going to be too many colors, so I started stitching and decided to make more choices as I went along. First up: Yellow. I used a Polyneon by Madeira Thread. Now it's on to other colors! Butteryfly is done except for the hand-stitching of the binding! I really like how you can see the orange. My favorite area is probably the clam/scallop shapes right above the butterfly's head. I double stitched them for more emphasis. This was stitched with an orange Glide thread by Fil-Tec. I decided to limit my palate of colors to three so the butterfly would still stand out. The final quilting was done with a red Isocord Poly thread. I went for a larger scale in part so it would show more and because I had a lot of space to fill! I also decided to put some large circles in a few places to try to unite the edge. The yellow stitching was small, the orange medium, and the red large. At first I wasn't too sure about this, but I'm glad now that it's complete because it really lets the butterfly stand out. The echoed clam shell in a circle above is probably my favorite design on the quilt. I love how it looks like a flower. Time to go hand stitch!